The media industry is facing a dilemma unlike anything it’s ever seen before. The business model upon which cable TV is built is dying, under siege from Web-delivered alternatives. But paradoxically, that same business model is also the future of Web-video and the media industry itself. How can it be both on the way out and on the way in? Especially when cordcutting is so rampant that it seems that everyone, consumers and content producers alike, are trying to get away from dependence upon pay-TV? There are many reasons, but to sum them all up, whatever replaces today’s TV distribution model be familiar enough to both consumers and media industry leaders alike to facilitate widespread adoption. Consumers are loving what they see on television. Even popular streaming services like Netflix and Hulu owe much of their popularity to content that originally came from cable and broadcast TV. One question gets at the heart of the problem: Why do consumers love Netflix and hate cable? The number one gripe with cable is that it’s too expensive, while Netflix is affordable for most. It’s not hard to see why the price of pay-TV gets so out of control when customers are forced to pay for hundreds of channels when they only care about a few. A second factor would almost certainly be device-driven. Consumers are watching more video on their tablets, smartphones, PCs, and other Web-connected devices. 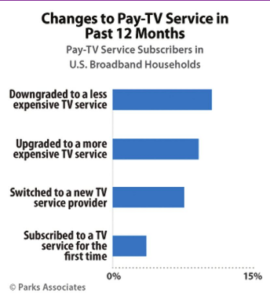 Yet even in 2016, the far more expensive cable subscriptions keep viewers tethered to a wall outlet, while requiring them to rent an outdated piece of equipment for the privilege. At the end of the day, consumers want to be able to enjoy the content that they love on their terms: at a fair price, and on the device of their choosing. 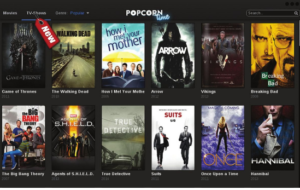 And while they’ve gained popularity, subscription VOD services like Netflix, or those being rolled out by individual TV networks are not the long term answer. What will get consumers excited about pay- TV again is doing exactly what cable has done for decades, only doing it online: bringing together content from all of the different sources with a guide to make it all manageable. While consumers would embrace lower-priced offerings, the media companies live in fear of seeing their revenues dry up. Cord-cutting is such a threat precisely because so many networks depend upon monthly subscriber fees from millions of customers, many of whom may never spend a minute watching their channels. But while networks are afraid of losing those revenues, by trying to protect them, they could be leaving even more money on the table. We’ve seen this play out with the music industry. The fact of the matter is that if customers can’t get the content they want on reasonable terms, they’ll simply steal it. As cord-cutting becomes the norm, the holdouts will only end up encouraging consumers to do that before they return to pricey and inflexible pay-TV packages. But as the music industry has experienced, there are many ways to monetize content, and the ideal scenario from the business perspective is to maximize all of them. In the television business, there are three options for doing this: Pay-per-view, where a consumer pays to access a piece of content, a subscription model, and finally free content supported by advertising revenues. The beauty of cable TV was that it brought all of these together for the consumer. Now web-based services are starting to do the same, literally replicating the cable TV footprint on the web. Currently Netflix dominates the discussion of online television, but the reality is that Netflix is a poor standard-bearer for the future of the television experience, because it’s a closed library, and one that is increasingly alienating the traditional media companies rather than bringing them together into a single service. No single library, not Netflix or Hulu or HBO Now, can truly offer consumers everything they want to watch. Only an agnostic media aggregator can do that. And one can do it even more easily than today’s cable companies can. FreeCast’s own network, which powers Rabbit TV Plus, 2 Buck TV, and Select TV, is particularly easy for content providers to take advantage of. Rather than the high stakes negotiations required to strike a deal with even a small cable TV provider, working with FreeCast is practically turn-key online monetization. By simply providing a feed or VOD content, FreeCast offers multiple options to monetize content, but perhaps more significant is the opportunity to maximize them all. The simplest option is that to reach the company’s more than 4 million subscribers, at no cost, while keeping 100 percent of their ad revenue. For premium content, they then have the option to charge for it on a pay-per-view or subscription basis. While the current system features each of these options for content creators as well, they don’t work in harmony. With ad-supported, subscription, and pay-per-view content all in one place, it’s much easier for content providers to “upsell,” luring viewers in with freely available content, and using that opportunity promote their premium options. Re-creating the cable ecosystem online offers a clear benefit to the industry, and also a benefit to the consumer, which in turn benefits the industry once again. The easier it is for consumers to access and purchase content, the more money the industry will make. This direct pipeline from the content provider to the consumer is everything. It makes it possible for the consumer to get content at lower prices, while even more revenue remains with the content provider. That direct connection with consumers also inherently remedies so many of biggest frustrations that consumers have with the incumbent business model. Currently, a single cable or satellite company stands between consumers and the content that they love. So from high prices to poor customer service, it becomes the scapegoat for every shortcoming. But thanks to nearmonopolies in their markets, consumers are left with little recourse. All that changes when content providers are dealing directly with consumers. When the choice is no longer between simply putting up with problems and going without pay-TV at all, the bad rap associated with pay-TV will disappear. Individual content providers are suddenly incentivized to provide a good user experience, customer service, and reasonable prices. That builds brand loyalty in a way that just doesn’t happen with the current system. By getting to know their consumers on the retail level, networks and studios will be able to tailor both content and ads to their audiences better than ever, while bringing more of the media industry’s revenues out of the pockets of middlemen and back to the content creators. The benefits of moving the entire kit and caboodle of the cable ecosystem onto the web are already clear, and growing by the day. But the media industry has been slow to embrace the opportunity. While much of that has to do with the seeming difficulty of making that transition, the biggest obstacle is almost surely the fear of harming the revenue streams on which they presently depend. But despite consternation in the media industry over cord-cutting, the move online is in fact a positive sum affair that will ultimately result in a vibrant and profitable media industry where opportunities abound for the big titans of the media industry as well as the YouTube star building a following from their bedroom. OTT revenues are rising rapidly, and consumers are signing up to multiple OTT services in droves. This rate of growth is nearly matched by the rate of decline in traditional pay-TV, as the consumer exodus from pay-TV continues, taking revenues with them. This trend has showed no signs of abating. With OTT on the rise while cable & satellite decline, the online space is quite clearly the smarter place to be invested. Once the big players in the media industry take the plunge and stop trying to delay the demise of the already stumbling cable TV gravy train, they’re almost sure to discover a host of even more lucrative opportunities.